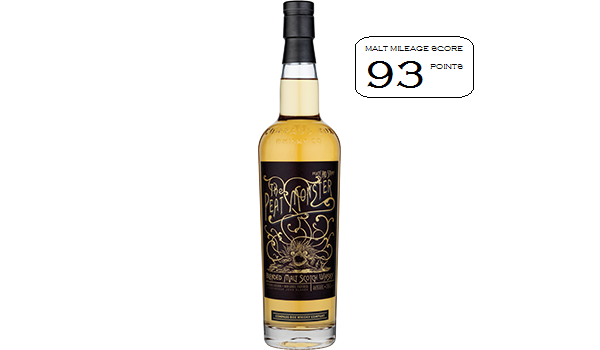 No whisky company can ever feel truly complete without the addition of a peaty whisky to its happy little family, and the peaty member of the Compass Box family is Peat Monster. The whisky is a blend of malts from Speyside and two Scottish islands that are known for peaty perfection, Islay and Mull. Peat Monster combines the classic peaty, medicinal, fiery and tarry notes common to whiskies from Islay and Mull with rich medium-peated Speyside malts, and marries them together in refill American oak casks. The American oak imparts vanillas and some sugars but they taste subdued, dominated by the peat rich distillate as it holds back the sugars with its heavy, almost earthy, character. This is definitely a monster of a whisky, but a friendly one at that! At £38 or $79 it is a good value malt blend that marries the flavours from Islay, Mull and Speyside and puts them into one bottle. It is however challenging and seems to be designed for the serious peat lover in mind precisely because it showcases the layers of complexity that can be achieved by blending peaty malts from different distilleries. Nose: Peat, coastal notes, tarry rope, nylon, cayenne pepper, sweet paprika and toasty vanilla fill the glass with salted caramel, mild ground coffee, cocoa and shimmers of cherry flavoured cough drops that carry medicinal notes of betadine and menthol. There are also a few surprises, as the bouquet offers occasional gusts of filo pastry, honey and nuts, raisin, white chocolate and strawberry-vanilla macaroon. No single distillery comes to mind when nosing this whisky, because it does comprise of whiskies from Mull, Islay and Speyside. Part of this whisky does however glisten with sherry matured Ardmore, as gusts of sweetness shine through the fog of peat – intriguing. Taste: Fiery on the entry, the peat takes the lead with dashes of salinity and a big smoky meaty core – think thick rashers of oily bacon served sizzling hot, but not crisp, with some HP sauce slathered on the side with very mild hints of hot English mustard and the (good?) old days of the morning cigarette. Red peppers emerge within that meaty and peaty haze, and as it settles grassy floral notes emerge with dried petals and green foliage (not particularly perfumed but aromatic, flowering strawberry fields on a hot sunny day come to mind). Finish: The grassy floral notes gradually dry, as the peat lingers with charcoal embers and an underlying metallic note akin to biting a coin (as you do…).